Vermiculite as an interspersing medium in chick breeding or as cat litter. 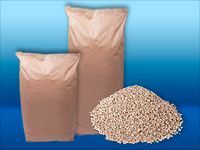 The absorbed vermiculite improves the digestion (grinding in a chicken's stomach) of the food and supports the healthy growth process of chicks. Due to the release of minerals and trace elements contained in vermiculite, the immune system is strengthened. Due to the brittle surface structure of vermiculite, the soft, light feathers remain hanging under the breast feathers of birds. Mixed with other mineral components, vermiculiteserves as an interspersing medium in bedding for poultry, cattle, pigs and other animals.